Home » Latest News » Contests » Enter our February contest! 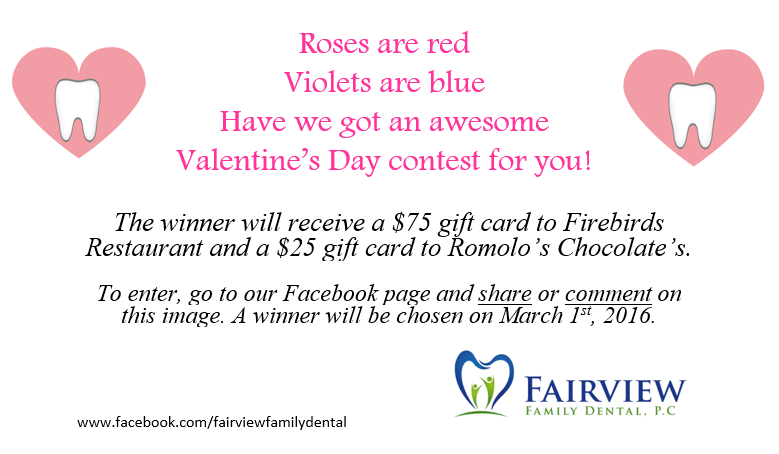 It’s a new month, so that means there’s a new contest at Fairview Family Dental! This month, we went with a Valentine’s Day theme; the prize consists of a $75 gift card to Firebird’s Restaurant and a $25 gift card to Romolo’s Chocolates. Then, comment on or share the image. Each user is allowed up to 2 entries, one for commenting and one for sharing. We will pick a random winner on March 1st. Good luck! !